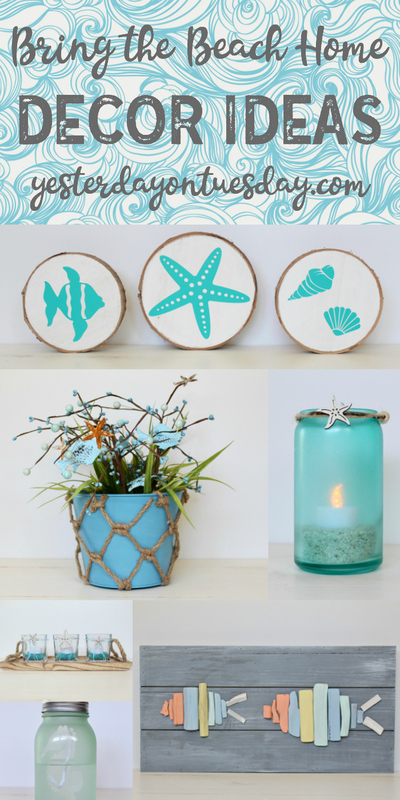 Summer is really truly here… so let’s keep those happy vibes going with these Bring the Beach Home Decor Ideas! You can see these idea live on KOMO TV Tuesday June 27th at pm. 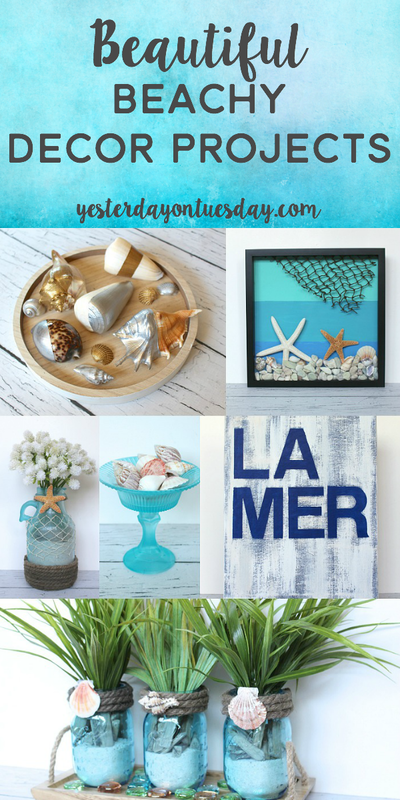 All the fun supplies used to create these projects are from Ben Franklin Crafts and Frames in Redmond, a great family owned local business! Supplies: Blue wood sign, small pieces of driftwood, light orange, blue, green yellow and white and hot glue. 1. 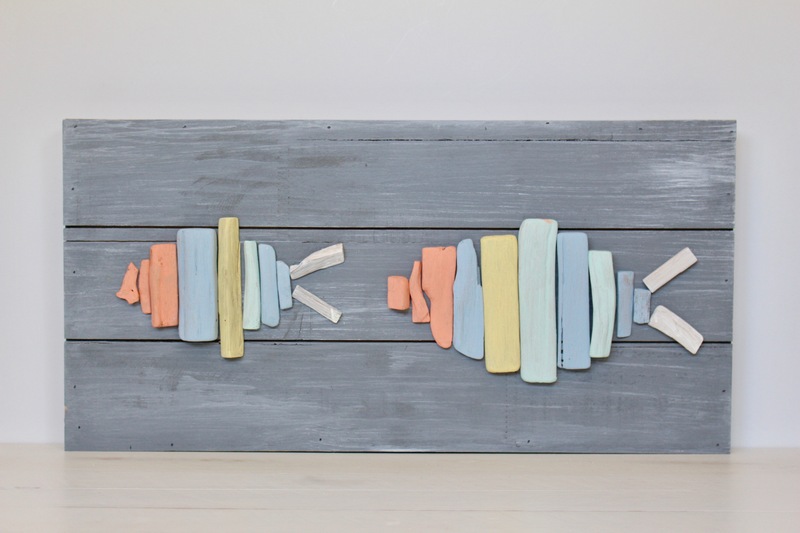 Arrange wood pieces into fish shapes. 3. Glue wood pieces to sign. 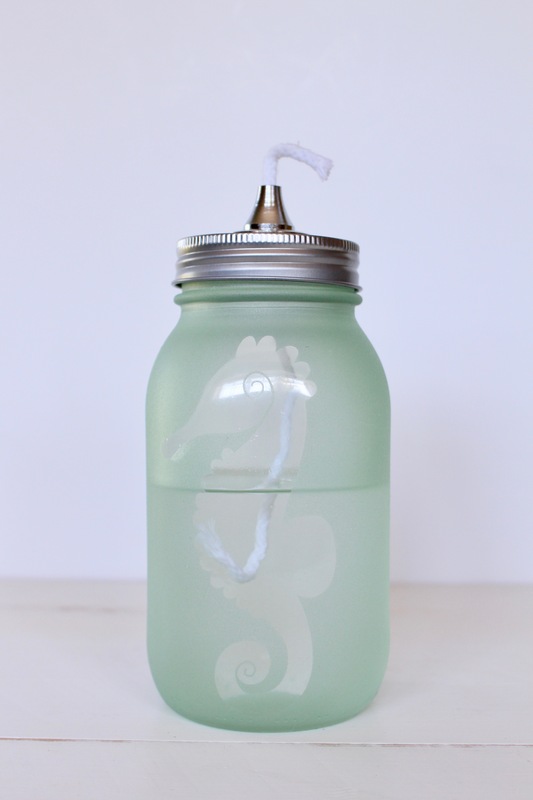 Supplies: Quart sized smooth side mason jar, Krylon Sea Glass Spray Paint in Sea Foam, Lamplight Ultra-Pure Paraffin Lamp Oil, oil lamp lid wick and seahorse vinyl. 2. 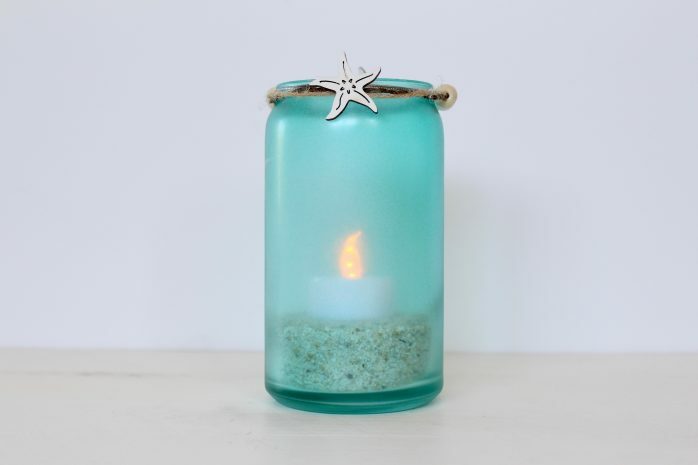 Spray the jar with Krylon Sea Glass Spray Paint in Sea Foam. 4. Fill with Lamplight Ultra-Pure Paraffin Lamp Oil and add the oil lamp lid wick. 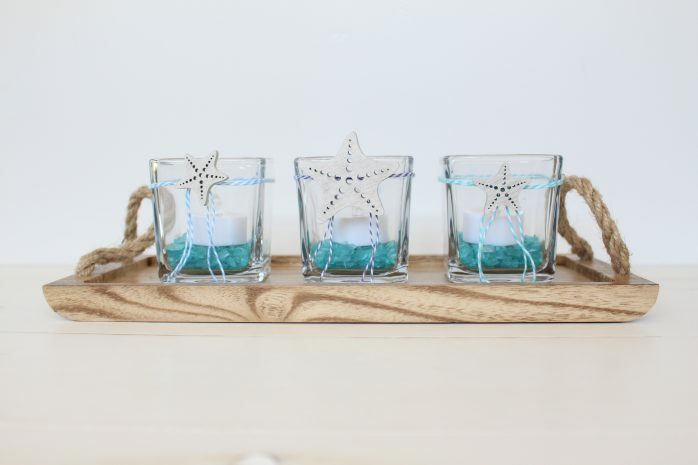 Supplies: small glass candleholders, Darice Gems, votives, baker’s twine in different shades of blue, small wooden starfish, hot glue, and wooden tray. Directions: tie twine around glass candle holders. Use hot glue to secure starfish. Add gems and votives. Display on wooden tray. 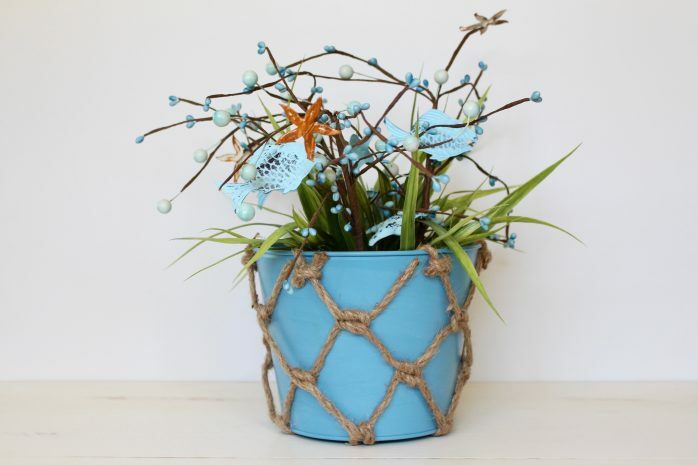 Supplies: bucket (it comes with the netting), sand, faux sea grass and nautical picks. Directions: Add sand, to the bucket. Tuck in faux seagrass and nautical picks. Directions: 1. Spray cylinder with Tint It. 2. Add sand and votive. 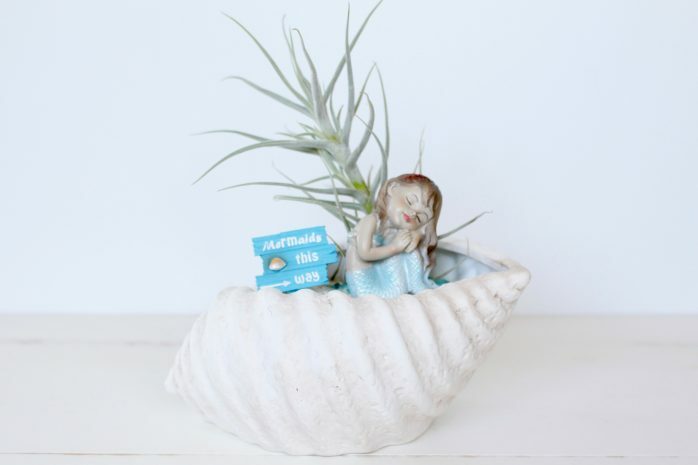 Supplies: Large faux seashell, sand, mermaid, sign, and air plant. 1. Fill shell with sand. 2. Add plant, mermaid and sign. 3. Remove and mist air plant every few days. 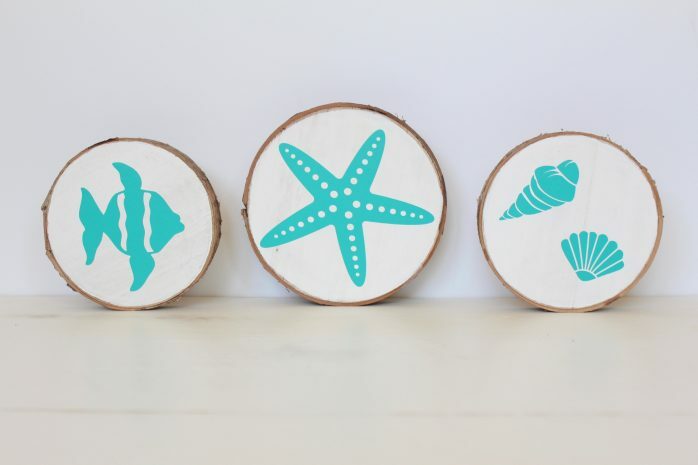 Supplies: wood slices, white acrylic paint, beachy themed vinyl. 1. Paint the wood slices white. Great projects! I\’m a sucker for anything beach-y. Now I want to find myself a vintage mini mermaid!! Visiting from Best of the Weekend party.